The grass grows and grows. It is eaten and scratched up and left for dead as the livestock move through, and still it persists. After our first fall we were concerned that nothing would grow back. The cattle and turkeys get huge and consume massive amounts, leaving short grass behind. Then when spring arrives boom! Everything grows back. 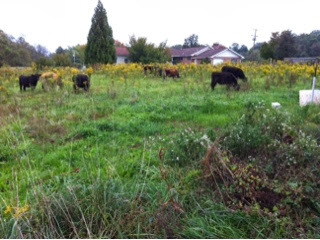 And now the cattle are in our neighbors favorite location. She can easily see them from the windows of her house. She used to live on this property, until they built a different house, a one story house, and moved next door. We invited her to visit and tour, to let her know what we are doing. She declined, telling us that her view from her windows onto the cattle the 3-4 days she sees them is just fine. She probably knows we will put her right to work.